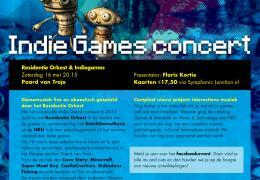 May 16th 2015 will be the second edition of the 'Indie Games Concert'. Yorick Goldewijk, Douwe Medema, Bart Delissen, Paul van Vulpen, Stan Koch, Ivo van Dijk, Colin van der Lei, Than & Matthias van Nispen t.P. 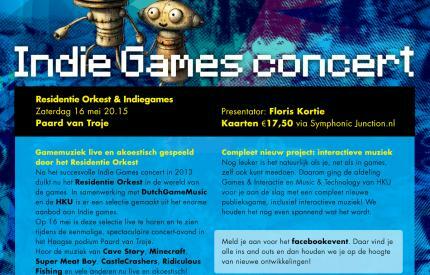 DutchGameMusic also would like to thank the many listeners and funders of our Indie Games Concert 2013 - live recordings on BandCamp! They made this 2015 Concert partly possible. "Videogames are young, yet their influence on modern culture is unmistakable: blockbuster games gross billions of dollars, children play Angry Birds, office workers play Solitaire and games are increasingly relevant to fields far beyond entertainment. Modern technology has caused a small revolution in game development in the past decade: with digital storefronts came the ability to self-publish, with Twitter and Facebook came ways to connect to fans without billions of dollars in advertisement. These and many more have given rise to a new force in the world of game creation: the independent developer. The ‘indie’ is a developer – or a small group of developers – that makes games independent from large companies. They’re the developers that make games because they want to, the people that can take risks because they have no stakeholders. These are the people that’d rather eat noodles for a month than allow their designs to be obfuscated by financial realities, the people that explore new grounds because there’s no commercial incentive to play it safe. In the past few years, indies have become an important part of gaming. These interesting, artistic and experimental games are – besides deeply personal to their creators – often pushing the boundaries of the medium. Can we use games to trigger a sense of guilt? Can games be used to show people the world from a different perspective? Is a game a way to express or explain complex societal issues? Can games be more abstract instead of realistic? What is a game? What isn’t? Do games need to be fun? What would a game inspired by Escher look like? Or a game based on the visual style of Kandinsky? Are there games that should exist but do not exist yet? Can you make a game in two days? Can you make a game without screens? For every indie developer working from their home, a small office or an office building, there are unique motivations, questions, answers and perspectives brought into the medium games. In the end, that’s what indie is: it’s hobbyists and professionals, working to breathe another perspective into games. Not because the commercial”, blockbuster perspective is bad – but because this more personal approach to games sometimes yields beautiful things."